NPO “European Institute for cultural tourism “”EUREKA” is pleased to invite you to the workshop “Labor mobility in the cross-border area of Dobrich-Constanta” under the project “Joint services and initiatives for sustainable employment and labor mobility in the cross-border area of Dobrich district and Constanta county”. The event will take place during 24-26 April 2018 in Constanta, in the Conference hall of Hotel Ibis Constanta. On November 29, 2017 in the city of Dobrich a press conference was held for the beginning of the project “Joint services and initiatives for sustainable employment and labor mobility in the cross-border area of Dobrich district and Constanta county", acronym “LAB mobile”, implemented by Non-profit Organization “European Institute for cultural tourism EUREKA” (Lead Partner), in partnership with the Chamber of Commerce and Industry – Dobrich, ”Ovidius” University of Constanta and the “Institute for the Promotion of Tourism and Applied Economy” Association, Constanta. From 15 to 17 June 2017 in Belgrade representatives from NGO“European Institute for cultural tourism “EUREKA”” participated in the international conference entitled “Cultural Heritage Counts for South-East Europe”, organized by Europa Nostra – Europe’s Cultural Heritage Preservation Network. NGO“European Institute for cultural tourism “EUREKA””has been a network-member since 2014 and continues to be the only representative in Bulgaria. 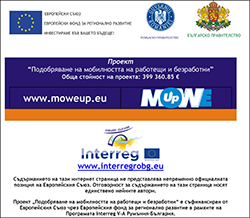 On May 22, 2017 Non-profit organization "European Institute for Cultural Tourism "EUREKA"" started the implementation of project "MOWEUP"
On May 19, 2017 the Municipality of Krushari and the Regional History Museum of Dobrich started the implementation of the project "A Cross-Border Union in the Shadow of History"
On May 17, 2017 Non-profit organization "European Institute for Cultural Tourism "EUREKA"" started the implementation of project "LAB mobile"